Whiplash is a very serious medical condition. It can cause severely debilitating injuries. It results from a sudden acceleration and deceleration force that causes unrestrained and rapid forward/backward movement of the head. This injury happens when the head and neck jolt in opposite directions causing strain or sprain. 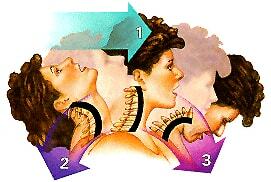 During a whiplash incident, different parts of the body are affected. The head and neck receive the brunt of the impact and the back muscles are extended in an abnormal direction. Once hit, the lower and upper cervical vertebrae are extended in different directions. The collision causes them to retract into an “S-shape” which contorts them in an unnatural way. The shearing force often causes disc or joint compression that can be damaging to soft tissues such as ligaments, facet capsules and muscles in the spinal region. If you are a victim of whiplash, seek immediate medical treatment. After an accident, adrenaline and cortisol are released to combat the effects of the accident. Shortly, those hormones will wear off and the subsequent pain should not to be ignored. If the doctor does not find any evidence of abnormal spinal alignment, they will give you treatment as soon as your symptoms allow. Sometimes, a doctor will place a whiplash victim in a neck brace or soft cervical collar following a crash. The best course of action requires an optimal diagnosis of causes, treatments and outcomes. Most of the time, medical professionals will use specialized imaging (MRI) to determine the severity of the injury. Without proper care or information, a patient may experience whiplash associated disorder. This disorder includes symptoms of depression, anxiety and unforeseen complications or aggravations. To best treat whiplash, doctors will often wean the patient off of a cervical collar in favor of gentle and active movement. Early return to normal range of motion and exercises will contribute to rapid recovery. Rotational exercises are performed ten times per hour within the first four days of the injury. With active and gentle movement, the damaged muscles can properly heal. To prove that whiplash came as a result of negligent behavior, consult with a Columbus whiplash attorney. Our attorneys are able to fight for your whiplash injury compensation based on the evidence of your case. Regarding carelessness and negligence, you must be able to prove the other driver breached their duty of care and caused a crash that made you suffer legally recognized damages. You can reach Heit Law by phone at 614-898-5300, toll-free from anywhere in Ohio at 877-898-HEIT (4348) or via email to schedule a free initial consultation.